Reserve Familiale. Decidedly not cheap but we were enjoying so much that we didn't include tasting notes!..below is what the experts have to say. 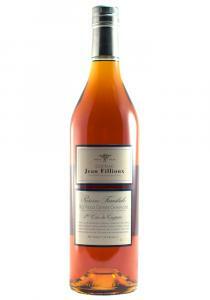 In July 2013, Jean Fillioux Reserve Familiale Tres Vieille Grande Champagne Cognac was named named Top 40 Spirit in the world by F. Paul Pacult's Spirit Journal, praised it for its "Tart, densely fruity, startlingly fresh for its age, and acutely resiny; midpalate is multilayered, cheese-like, woodsy, herbal, honeyed and rich. Crazy delicious. Phenomenally luscious. A benchmark for the ages from the genius of Pascal Fillioux." Exclusively from Ugni Blanc grapes harvested on the Fillioux estate (the estate only grows this single varietal grape). Once the grapes are harvested in late September or early October, they are immediately pressed into a grape must. The must enjoys a high acidity and is lacking in tannins, making it ideal for fermentation and distillation. After Fillioux has fermented the must into a wine, he distills the wine twice through a traditional, antique charentais-pot still.